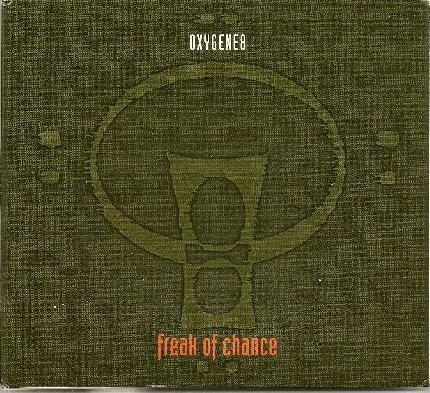 Oxygene8 - "Freak of Chance"
Oxygene8's debut is a 5 track, 22 minute CDEP. The musicians present on all tracks are Linda Cushma on Chapman Stick and vocals and Steve Parrish on guitar, synth and vocals, along with guests on various tracks, including the legendary Tony Levin on bass on one track, and Primus drummer Tim Alexander on two tracks. The CD opens with "Close Your Eyes", an accessible song with a mixture of rock, drum 'n bass grooves and dreamy atmospherics. This is the track with Tony Levin on bass, and while he's just keeping the rhythmic pace moving, the bass sound really throbs in your chest and head. The song is a bit poppy but the music has lots going for it. Beautiful guitar work and soundscapes and great grooves. "No Different But Not The Same" is similar, but with cool freaky synth embellishments and an all around electronic feel, though the guitar adds a nice fuzzed sound to the music. And Cushma's Stick work interplays nicely with the rest of the instruments. "Don't Look Down" is a poppy love song, but with off-kilter dance grooves, a potent bottom end and an ethereal vibe. And later in the song we get a nice ripping, if all too standard, guitar lead from Claudio Cordero. "Freak of Chance" rocks harder than most of the songs and we finally get to hear some intricate Stick work from Cushma, plus screaming guitar licks from Federico Miranda. Nice. Finally, the CD closes with "Poetica reprise", a mix track that includes everyone that participated on the album. The promo sheet indicates that Oxygene8 have played at a number of prog rock festivals. To my ears this music is way too pop oriented to call them a prog band, though the music, while not overly complex, is far more adventurous than most pop music you'll hear. I'd like to hear them flesh out their songs with at least a little more instrumental segments. They've certainly got the chops for it. For more information you can visit the Oxygene8 web site at: http://www.oxygene8.com.